...makes marking patchwork units quick as a whistle! 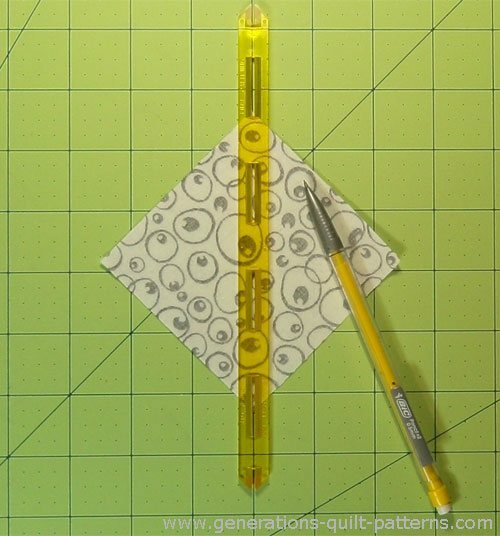 The Quick Quarter Ruler is the well-named quilting tool used by quilters to quickly and accurately mark quarter inch stitching lines for half- and quarter-square triangle units, along with Flying Geese. The tool can be used for either the Quick Pieced or 8 at a Time methods for making half squares triangles (HST). 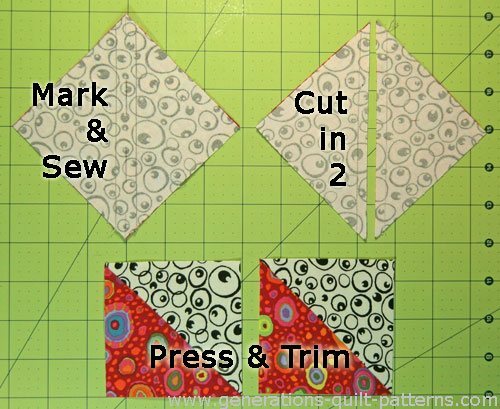 Since quarter square triangles are nothing but 2 pair of HSTs, you can use it to mark Quick Pieced Quarter Square Triangles. Last but not least—use it, too, for our Four at a Time, No-Waste Flying Geese units. The Quick Quarter works exactly as advertised. To mark both lines with a standard quilt ruler, you re-position it for EACH line or twice per square. For marking, say, 100 squares, that adds up to a big time savings. YOUR time. On the other hand, this is another ruler to store whose job can be replicated with your regular rotary ruler. You may find it easier to stitch on the drawn line with an open toe applique foot because there's nothing obstructing your view of the marking. This foot may or may not already be in your accessory case. Click here to see possible options for your sewing machine if you don't already have one. On the back side of a square patch, line up the center notches in this ruler with a pair of diagonal corners. Mark along each side of the ruler. I prefer to use a mechanical pencil because the line is always the same size. In this example a lead pencil is used. If this were a darker fabric I'd have chosen my favorite Bohin mechanical chalk pencil (in white) for an easier-to-see light colored mark. Sewline also offers this type of marker, though I personally haven't used one. Hold the pencil at an angle so that the lead is right next to the ruler. Sometimes the pencil wants to grab and pull on the fabric. If it happens to you, try marking each line from the center out to minimize or eliminate this problem. You may choose to mark in the notches, too. This notched line represents the cutting line. After marking, your patch looks like this. The arrows point to the solid stitching lines. 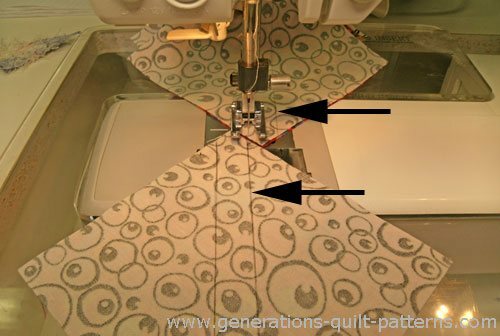 Now layer your patches right sides together and stitch on the drawn lines using your normal machine set-up for piecing. 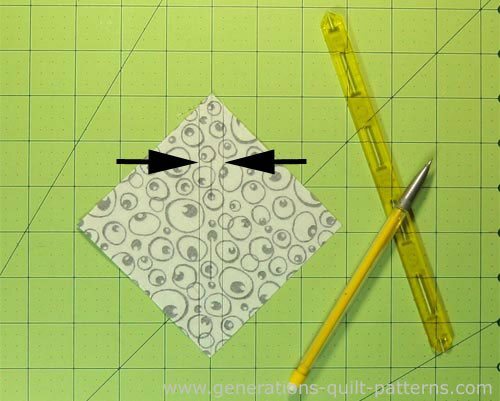 If you are sewing many half square triangles, make your work easier by alternating between the two different line positions. Notice how nicely the patches snug up to each other—much less chance of your sewing machine 'eating' the edge as you stitch. Press the patch flat to set the seams, then cut the square in two between the two stitching lines—or on the dashed line if you drew it. Finally, press the patch open with the seam allowances to the dark (traditional), or light (possibly to reduce bulk) or open (to reduce bulk). The choice depends on your preferences and needs. Trim to size if necessary. In the photos above, my trusty Quick Quarter is yellow (I've been quilting almost since dinosaurs walked the Earth). These days they are made out of a blue plastic. They come in two sizes—8" and 12" inch. Mine is eight inches long and I've never had need of a longer one. The eight inch ruler works for squares up to 5-1/2". The twelve inch spans the diagonal of squares cut up to 8-1/2" x 8-1/2". Click either image below to go directly to Amazon.com to read reviews and/or purchase a Quick Quarter Ruler that fits your piecing needs. Can't decide which size would be best for you? Fons and Porter offers two different 2-packs. The first includes two of the standard size. The extra-long 14"/18" combo shown below works well for quick piecing with layer cake precuts (whose diagonal measurement is a hair over 14"). Omnigrid offers a 3-pack for even more versatility.